Please make your selections above. 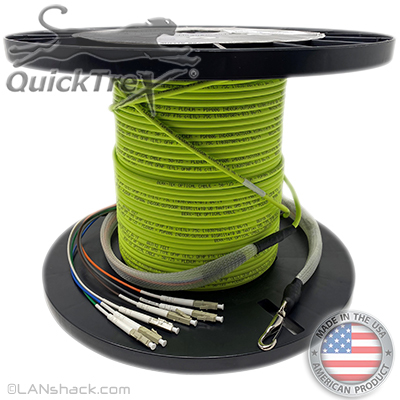 Our QuickTreX® Custom Pre-Terminated Fiber Optic Assemblies have a longstanding reputation for quality and reliability. When we receive your custom order, we build the assembly to your specifications using the finest materials to our exacting standards. The assembly is made in the USA by skilled technicians under controlled conditions and comes to you fully tested and ready for immediate installation. This Custom Indoor / Outdoor Plenum Rated OM5 (50/125) - 10/40/100/400 GIG- Multimode Pre-Terminated Fiber Optic Assembly offers the latest state-of-the-art fiber optic technology. It's rated for up to 400GIG and since it includes the same 50/125 Micron core it's downward compatible with 10G, 40G, and 100G networks. At the rate at which the latest technologies are advancing you can be certain our OM5 assemblies are your best bet at future-proofing your network infrastructure. OM5 cables also supports multiplexing with allows for different light wavelengths to be sent through the same strand. As components advance your OM5 infrastructure will allow you to benefit from this technology and expand your network using your existing strands that are in place. 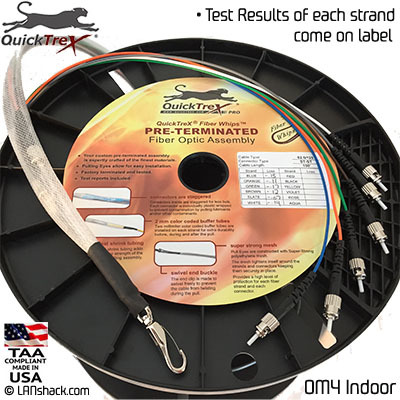 QuickTreX Indoor/Outdoor Pre-Terminated Fiber Optic Assemblies are perfect for connecting the networks of two buildings through the use of an underground conduit (below the frostline). This fiber is suitable for Indoor and Outdoor use, so there is no 50 foot fire code requirement traditionally found with Outdoor cable. The Indoor/Outdoor cable utilizes a DryGel water blocking system in the cable core to protect from situations where light water infiltration may exist like in an underground conduit or also in an indoor situations where the assembly may be exposed to a damp or moist environment. This cable also features a fugus resistant jacketing and is sunlight. Since this cable is includes a standard plenum rated jacket it allows you to transition from an outdoor environment to and inside plenum environment without having to couple to another separate cable. The plenum rated tight-buffer cable is perfect for campus and building backbone cabling infrastructure. This distribution cable can also be used in any channel from Telco, CATV, WAN LAN, SAN, Broadcast, DAS, Communication, and Security. • All Pre-Terminated Assemblies will be custom made at the time of your order, built with premium fiber and premium components to your specifications. 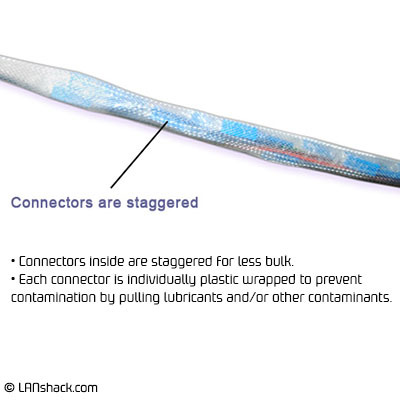 • Each strand will be reinforced with 2mm color coded furcation tubing which helps identifying and ruggedizing each to help protect it during installation. 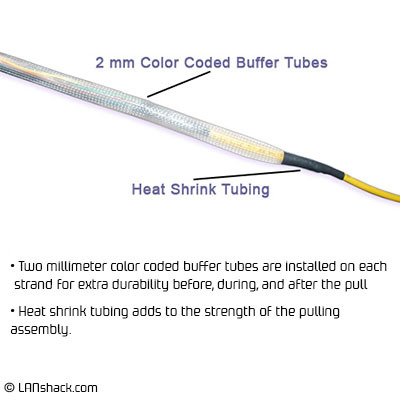 • The buffer tubes will be securely fastened to the breakout kit using high strength adhesive type heat shrink tubing. • The connectors itself will be staggered per pair to minimize the size of the pulling basket. • One wrap around label will be attached to each end of the cable assembly for identification. The label text includes the cable part number and a unique serialized number. 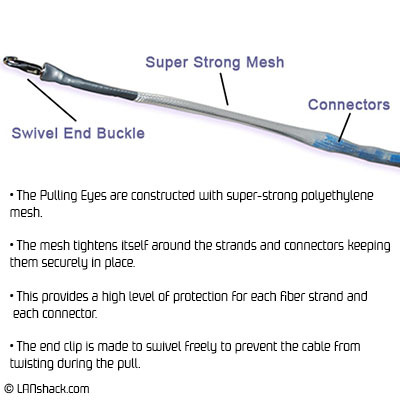 • Pulling Eyes (pulling baskets), if equipped are made from super strong polyethylene mesh and feature a free-spinning buckle to eliminate twisting of the cable during the pull. This will be the thickest part of your assembly. The pull buckle's thickest part is approximately 3/4" thick. *Note it's recommended a minimum 1" diameter conduit be used if applicable. • TESTING: All fiber ends are visually inspected with a fiberscope of 400 power or better for surface defects including, cracking, pitting, and scratches, on the glass surface of the connector. All ends are tested utilizing a Loss Test Set to the following standards: Mutlimode: 62.5/125 and 50/125: IL Max 0.2db, Min -.01db Singlemode: IL – Max 0.2dB Min - .01dB - ORL (optical return loss) - 55dB Note: On “Loss Over Distance," Singlemode Fiber has a typical loss per Kilometer of 1.0 dB at 1310 MN, 1.0 dB at 1383 MN, 0.75 dB at 1550 MN. • Test results will be included with each assembly. Lead time: Varies usually between 2 to 3 days. Call or email Sales at 888-568-1230 option 1 for a current estimated time. NOTE: Due to the fact that this is a custom made cable assembly, it is non-cancelable and non-returnable. Please choose your product description and specifications carefully.